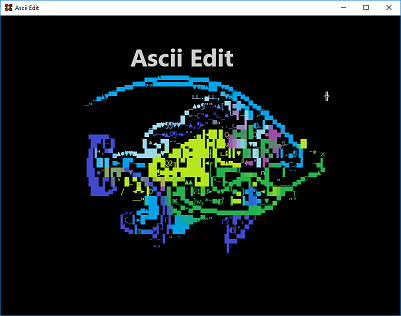 AsciiEdit is a free program that allows you to edit images that were converted using AsciiConvert, in the style of old-fashioned ascii art from the day of BBS yore. First, Download the program and unzip it into whichever directory you wish to use. There's no install, and the program does not alter your registry or any settings. 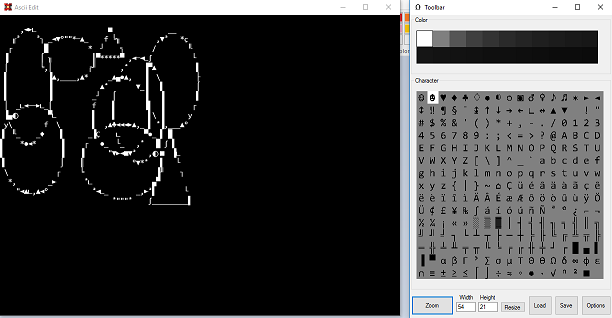 The left text box is the image you're editing, us the left mouse button to paint with the active color (selected colorbox on the toolbar to the right) or the right button to place a selected character (from the character boxes below that.) Click on the toolbox icon or color to change the selection, right-click on the colors to define your own. Questions? Comments? Contact me at "Demandmenothing" at "gmail.com"